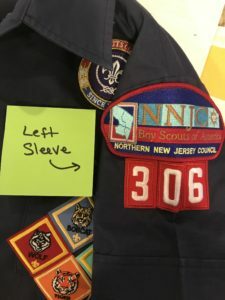 The blue uniform shirts worn by our Tiger (1st grade), Wolf (2nd grade), and Bear (3rd grade) Scouts should look something like the shirt below. 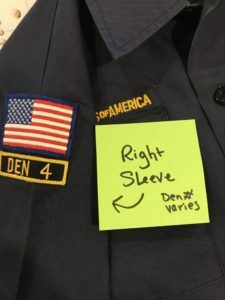 The den number on the right sleeve would vary, though it is kept by the grade as they move up the ranks. If you do not have the time or inclination to sew patches, there are sticky-back and iron on solutions. Many families use “The Patch Lady,” who is a Ramsey mom. She charges almost nothing, and is super fast, and easy to deal with. Ask your den or pack leaders for her info. Or see her facebook page here. 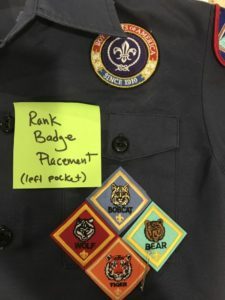 Your scout might earn badges beyond what is shown here, some would not be worn on the uniform at all but, would serve as a keepsake.